“Four score and seven years ago” began what time would remember as a milestone in American history. On November 19, 1863, President Abraham Lincoln delivered the Gettysburg Address, a speech that many consider among the most eloquent and important of all time. The address is inexorably tied to the Battle of Gettysburg, one of the milestones of the Civil War that brought Union and Confederate armies together in rural Pennsylvania’s countryside. After three days of fighting, more than 50,000 soldiers on both sides were dead, wounded or missing, becoming the bloodiest of the war and marking a turning point, one that would lead to Lincoln’s Gettysburg Address just over four months later. 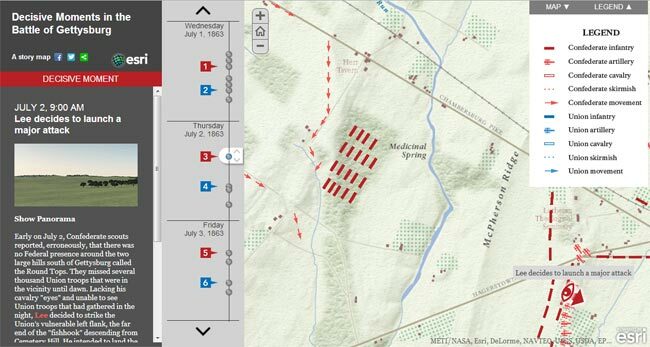 Esri and Smithsonian teamed up with Anne Kelly Knowles, a geography professor at Middlebury College to create a story map about the battle. Knowles has done research in historical geography using GIS; among her projects have been the Holocaust and the Battle of Gettysburg. For the latter, she used historical maps in combination with landscape and viewshed analysis to determine what the battle’s commanding generals could see from their vantage points at key moments in the battle. Her thesis: That decisions were affected, sometimes fatefully, by what commanders could not see from where they stood. For the story map Esri worked not only with Knowles, but with Alex Tait, vice president at International Mapping, a custom cartography firm in Maryland. Tait helped produce a series of computer-generated panoramas simulating the viewpoints at “decisive moments” in the battle. Knowles did the writing and, of course, the original research; Esri provided design, development, mapping technology, and hosting. Story map program manager Allen Carroll notes that the story map is the most popular to date, perhaps a testimonial to the combination of an interesting topic and a powerful way to explore it. You can explore other story maps by visiting Esri’s Storytelling with Maps website.